A multi-trunked tree to 10’ to 20’ with striking red bark. New growth emerges purple and orange, turning to light green in summer. Beautiful golden fall color completes a year-round appeal. Fantastic evergreen ground cover for hot dry slopes. Once established, it does not like water or fertilizer. Pink flowers followed by red berries and green leaves that bronze maroon in winter make this plant a year round joy. ‘Vancouver Jade’ is an improved cultivar with better disease resistance. Once considered a “weed” in the Northwest, red-flowering currant , with its many cultivated varieties has found garden favor in its home town. 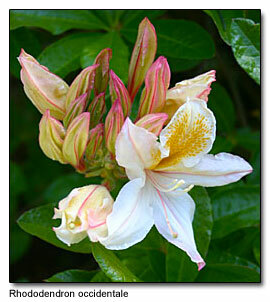 Included is this beauty ‘Brocklebankii’ with bright chartreuse foliage and pink cascading flowers. A delicate looking deciduous fern that, when planted in a cool, moist shady spot, is remarkably easy to grow. Light green ‘leaves’ are held upright to about 2’ by beautiful black slender ‘stems’. 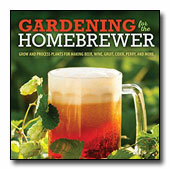 This is really a must for the shade garden. This wonderful flowering tree, shunned for susceptibility to anthracnose, should be planted where the top can be in the sun and enjoyed. Beautiful white bracts in April and September with red fruit and great fall color. What don’t you like? The practically perfect landscape shrub, a hardy broadleaf evergreen for sun or shade. Beautiful red bronze new growth with lots of pinkish flowers followed by edible black huckleberries make ‘Thunderbird’ a must for every garden. 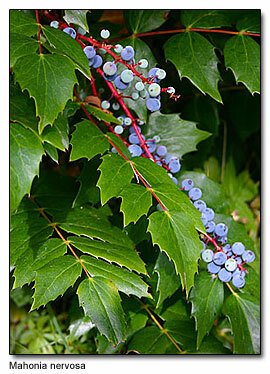 While the tall Oregon grape may have limited use in the garden because of size, this beauty stays smaller (3’) and not so overpowering. Bright yellow flowers and blue berries just add to the year round appeal of this evergreen. 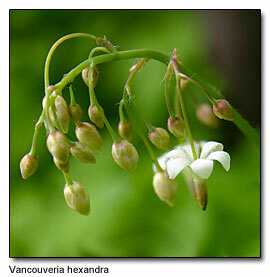 It grows equally well in sun or shade. I just love trilliums and, I think, this is the best of the bunch. This herbaceous perennial truly celebrates the rites of spring with its little white flags of flowers that are three petaled, perched above three large leaves. Part shade to full shade and plenty of organic matter will reward you with an ever growing clump of delightful spring flowers. A wonderful deciduous native shrub that has been used for years as breeding stock for hybrids and is now taking its place in native gardens. This ten-foot shrub sports a variety of flower colors, ranging from pale rose to white blotched with yellow and can be used in woodland gardens mixed with broadleaved evergreens. 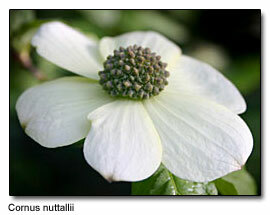 Last but not least on my natives list is a wonderful herbaceous perennial ground cover named after Capt. George Vancouver. This variety is one of three species exclusive to the northwest and has been the easiest to find in nurseries, but all three are great. Known for their unusual duck foot shaped leaflets and their small shooting-star flowers, these natives thrive in moist, shady woodland gardens. They are non-invasive; so watch out for them so other ground covers don’t swallow them up. Scott Conner's been in the nursery business for almost 40 years, 20 as a retail nursery manager and the last 20 as a teacher and a talk-radio host. You can listen to him at am1090 in Seattle.